During a recent trip to London I had my eyes opened to how good blended whisky can actually be. I was particularly blown away by the Grants 18. So with that in mind I have a bottle of Black Grouse as recommended in #101 whiskies to try before you die’ and approaching it with an open mind. If it’s in the 101 to try before I die book, it should be OK.
the nose is similar to brudichladich peat and waves single malt. A hint of smoke followed by a light and sweet spice aroma. On the tongue it is lightly peated and slightly bitter like candied grapefruit. On the finish the black grouse only has a hint smoke in the medium finish. Not bad at all! Black Grouse strikes me as something for the person who wants to be able to enjoy smoke and peat but just loves their Speyside too much, and needs a whisky with some of that kind of character in there. 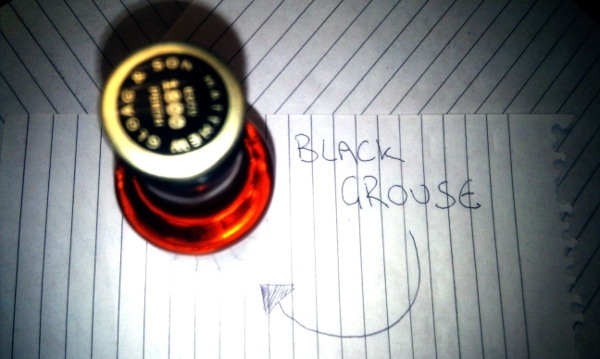 Everything I like about this Black Grouse whisky lies both within the nose and finish. Compared to some other similar whiskies I’ve had, the Black Grouse lacks that certain punch in the body, but I think perhaps this whisky is trying to bridge a gap between Speyside and Islay, and it is a valiant attempt, but its just a bridge too far in my book. But one hell of an effort. For my cheapish spey side I’ll stick with Glen Moray Classic, and for my peat I’ll take a proper kicking by laphroaig. Is it try before you die? well, kind of. I’m glad I’ve tried it now, because its a pleasant experience well worth a try.